Unified communications (UC) has been a market in the making for well over a decade, as companies look to improve corporate collaboration. One of the software leaders in the UC space is Microsoft. As organizations look past IM and presence to explore other productivity and efficiency gains that might come with Skype for Business integration, the next logical step is Enterprise Voice. 1. What are the risks of deploying Skype for Business Enterprise Voice? 2. What is the quality of Skype for Business Enterprise Voice? 3. How can Skype for Business Enterprise Voice transform my company? 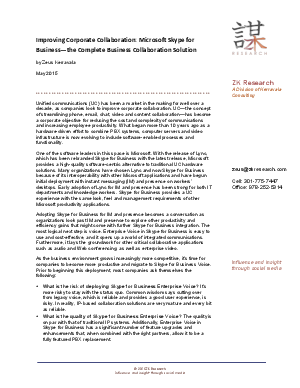 Step inside this whitepaper for guidance from UC industry analyst, ZK Research.